Memory Foam Mattresses For All! I came across a manufacturer by the name of Sleep Innovations recently, and I have to say I’m impressed with the memory foam mattresses they have to offer. At first, I thought I would post a separate page for each model but then I remembered that you probably don’t have the time to “wade” through my website so you can find what you’re looking for. 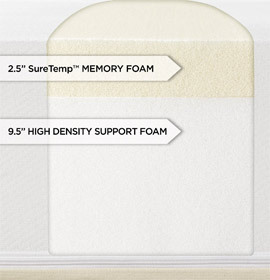 So, in the following few words, I’m going to tell you all about the Sleep Innovations SureTemp Memory Foam Mattresses, which incidentally all come with a 20 year limited warranty AND they’re all made in the good old USA. Of course, there are similarities between the models, so let’s start there. I’m going to review 3 different depths here but all of them have a section of high density foam at the bottom and a layer of the “special” SureTemp memory foam on top of that. For the cover, you get Poly-Cotton. I mention the word special because there are a couple of things this manufacturer has done which I think will help eliminate a lot of the complaints I come across with memory foam mattresses. Heat, for instance, is something that always comes up when I’m researching these mattresses and I think Sleep Innovations has come up with a way to help prevent this. They use their own patented open cell memory foam during the manufacturing process for strengthening the cell walls inside the mattress. This not only helps airflow, it also provides much better support than many other brands out there. In fact, Sleep Innovations will tell you their mattresses will even help with proper spinal alignment so the aches and pains you’re currently suffering will subside, and in some cases disappear altogether. You may also be surprised that these memory foam mattresses require no flipping. I’m no technical expert but this is down to the fact that the foam recovers far quicker after you’ve slept on it. O, and it’s also dust mite and allergen resistant. The only thing I will warn you about is the fact these mattresses are NOT designed for slat type bases. The manufacturer will even tell you they should only be used on the floor, box spring or any other base that doesn’t have gaps. Right! On to the different depths you can buy. This model will provide you with medium soft to medium firm support and it comprises of 9 ½ inches of high density foam at the bottom and 2 ½ inches of the “special” memory foam at the top. Due to the depth of the top layer, you can expect a sleep temperature that’s cool/optimal. The base layer of foam on this one is 7 inches, and the top layer is 3 inches. In terms of support this one is slightly firmer (for obvious reasons) but for those of you who don’t weigh very much, this might suit you better than the 12 inch. For those of you who prefer a much firmer mattress, you might want to consider this one in the range. It comprises of 6 inch premium support (at the bottom) and 2 inches of SureTemp memory foam at the top. Personally, I think this one is a great option for children as well as those of you who prefer not to sink right into your mattress when you sleep. Aside from the different depths you can buy, the manufacturer has also kept size in mind. All of them are available in Twin, Full, Queen, King and California King. If you do decide to order one, it will be delivered vacuum packed so expect to wait a few hours for it to expand to full size. Oh, and contrary to many other memory foam mattresses I’ve found VERY few complaints with regards to odor while this takes place. Personally, I think if you’re looking for a memory foam mattress that won’t cause the overheating many other brands do, want support across all the pressure points that matter in your body and something that will last, these mattresses are well worth considering. You may be wondering about cost. Well, I have another surprise for you! These mattresses do not run into thousands of dollars. In fact, if you take a look at Amazon, you’ll find it’s more like a few hundred, and the last time I looked they were offering some great discounts off the list price. You can go here for the 8 inch model. Here for the 10 inch model, called the Shea. Or here for the 12 inch mattress, the Shiloh. This is the most popular one.